A geothermal heating system use the earth surrounding a suburban home or other building. This ground contains a vast reservoir of low temperature thermal energy, typically 10 times that required over an entire heating season. This resource is constantly resupplied by the sun, the surrounding earth, and heat rejected while cooling during the summer. The term geothermal energy is defined as having to do with the “heat of the earth”. In a residential HVAC context, your home heating and cooling system can use the earth’s energy to provide up to 50% of a building’s total heating and cooling needs. Diamond Willow installs geothermal heating systems that are truly geothermal energy made practical. Closed loop systems circulate a water-based solution through a “loop” of small diameter, underground pipes. 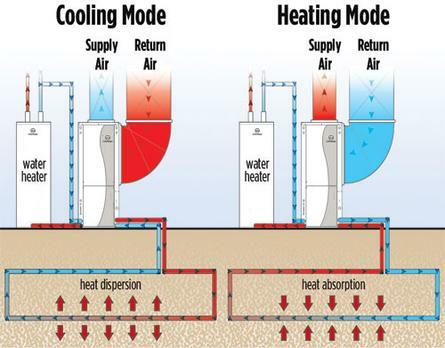 In cold weather this solution absorbs heat from the earth and carries it to the geothermal unit. The geothermal system amplifies the heat and delivers it indoors. In warm weather the process is reversed, excess heat is carried from indoors and into the cool earth. This helps keep your home refreshingly cool during hot summer days. To learn more about geothermal energy and closed loop heating, watch the explainer video below from the US Department of Energy. Contact Diamond Willow at (403) 932-0763 to find out more. A geothermal system uses the Earth’s thermal properties in conjunction with electricity to provide unprecedented efficiency. For every unit of electricity the system uses, it provides four units of heating energy, giving a geothermal system a 400% efficiency rating on average. These numbers can translate into real savings on your utility bills year- round. Lower operating costs: The Water Furnace system operates more efficiently than ordinary heating and air conditioning systems-30% to 60% in most cases. Economical Water Heating: Water heating can be a significant energy expense. Water Furnace units can reduce the high cost of water heating by as much as 66%.